I know, sounds counterintuitive that eating can actually help you lose weight right? But it’s true! This list of foods to eat and lose weight will make you feel fuller while providing your body with essential vitamins and nutrients. You’ll eat less of the bad stuff and have more energy to exercise and burn those calories. And with Thanksgiving right around the corner, it’s a perfect time to try some of these foods if you never have before. One thing most of the foods on this list will have in common is that they are high in fiber. When it comes to losing weight, fiber is your friend! Eating foods high in fiber is going to make you feel full, which is going to make you eat less. Foods that contain high amounts of fiber (vegetables, fruits, whole grains) also tend to be low in calories. So eating foods high in fiber make you feel full AND don’t have many calories?– that’s win win. Fiber is good for us for other reasons besides just making us feel full. Fiber helps regulate digestion, helps regular blood sugar levels, and can help lower cholesterol to name a few. There are many different forms of fiber, but they can all be broken down into 2 categories: soluble and insoluble. Soluble means it can be dissolved into a liquid. So, soluble fiber dissolves, or becomes soft when it comes in contact with water. This type of fiber is responsible for lowering our cholesterol levels because it binds to the bad cholesterol particles (LDLs) and flushes them out of our body. Insoluble fiber does not soften when it hits water, it stays firm and intact. This adds bulk to our waste and helps clean out our intestines. This type of fiber helps keep our digestive tract working properly, keeps us regular if you will. Both types of fiber are important for proper health. Eating a variety of fresh vegetables and fruits daily will ensure you get plenty of both types of fiber in your diet. It’s always recommended to try and get your vitamins and nutrients from eating whole foods, but if you are having a hard time getting enough fiber through diet alone, you could always supplement. 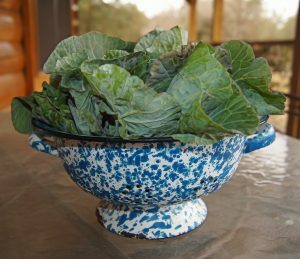 A soul food classic, collards are a member of the leafy greens, like swiss chard and kale. This food is very common in the south, but it really should be more common for all of us, because it could be considered a super food with the impressive nutrition it packs. A cup of cooked collards only has about 50 calories, give or take, depending on how you cook it, but it is high in vitamins K, A, C. It also packs about 5g of soluble fiber and 4g of protein to help you stay fuller, longer. Collards are often simmered with smoked meats until nice and tender. Click here for a tasty recipe. I’m lucky, me and my kids all love broccoli and eat it a couple times a week. I know a lot of families aren’t so lucky and it can be hard to find ways to add vegetables. But keep trying, it’s worth it, especially with broccoli. Broccoli is actually part of the same vegetable family as collards: the cruciferous family. With only 31 calories in a cup, it provides 3g of protein and 2g of fiber. It is fat free and high in vitamins C, K, and A, as well as potassium and folate (a type of B-vitamin). Try steaming broccoli until it is nice and tender then add a dash of butter or olive oil and a little salt and pepper. Sweet potatoes are another super food. My family started eating sweet potatoes when my son was born. It was an easy baby food to make ourselves and we knew it was healthy. A cup of sweet potatoes will only cost ya about 100 calories, but will be full of vitamin A (over 300% of your daily requirement), potassium, vitamin B6, vitamin C and fiber (3g for a medium potato). Long story short, sweet potatoes are one of the healthiest foods you can eat. They are sweet and delicious and the fiber will fill you up faster. 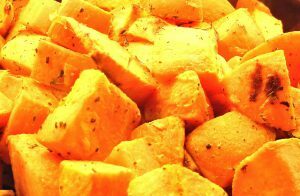 This Thanksgiving, save yourself a ton of calories and roast your sweet potatoes instead of making casserole- chop ’em up, toss with olive oil, salt and pepper. Roast at 400 deg for about 25 min until they are tender with a nice crispy skin…enjoy. One day eggs are good for you, the next they aren’t. Eggs continue to be controversial because they may or may not cause your cholesterol levels to rise. Eggs are high in cholesterol (well, the yolks are, egg whites are cholesterol free), but many studies show that eating eggs don’t contribute much to our overall cholesterol levels. Click here to see an article from the mayo clinic regarding eggs and cholesterol levels. I consider eggs healthy if eaten in moderation. A large egg is only about 75 calories and packs 6g of protein. One egg contains over half of the recommended daily intake of cholesterol, so if you are worries about the cholesterol, you could always avoid the yolk. Eggs, especially when combined with a high fiber whole grain toast, will help fill you up in the morning and keep you feeling full, longer. For a healthy breakfast, fry a couple eggs and throw on top of a slice of whole grain toast. Beans are another great source of protein and fiber, as well as potassium. Beans are a great protein source for vegetarians and vegans, but should be included in all of our diets because of all the other nutrients they contain. If you are trying to lose weight, beans should definitely be a regular in your diet because of all that filling fiber. 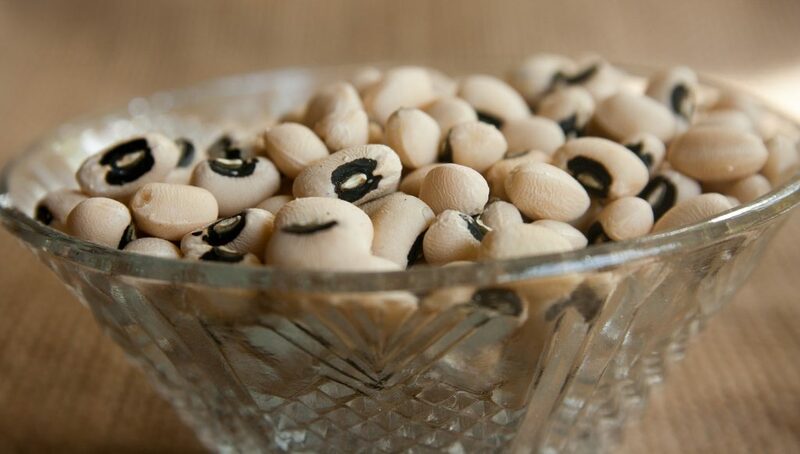 Depending on the bean, they contain anywhere from 6-10g of fiber per 1/2 cup! And only roughly 100 calories, impressive. Black beans, with 8g of protein and 8g of fiber is a personal favorite of mine. I learned recently that quinoa is actually a seed, not a grain (I’m not sure what the difference is). However, quinoa is usually prepared like a grain and is significantly healthier than most grains you’ll find. I like quinoa because it’s really high in protein, with about 8g per cup. A cup of quinoa will cost ya 220 calories, but will also pack over 5g of fiber with minimal fat. It’s high in magnesium and phosphorus, as well as a long list of other important minerals. Quinoa is usually cooked like rice. It’s delicious and healthy, give it a try. I’ll admit I’m not a huge fan of artichokes, but their health benefits can’t be denied. They have more antioxidants that blueberries and more fiber than your favorite bean. A medium artichoke is only about 60 calories, but high in vitamins C, K, and folate. 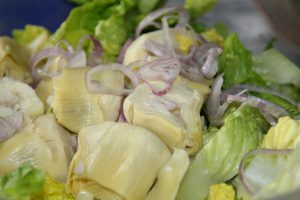 Artichokes even have a few omega fatty acids to round out it’s perfect nutrition profile. The easiest, healthiest snack! They are great raw and a medium carrot is only 25 calories. That same carrot is fat free and contains almost 2g of fiber. They are high in vitamin A and K, as well as potassium. If you are looking for an easy, healthy Thanksgiving dish, try roasting carrots and parsnips. Just peel and slice the vegetables to your desired shape and size, toss with oil, salt and pepper and roast at 400 deg for 20-25 min. You could throw some honey on them to really impress the family. Sweet and nutritious, even the kids will eat these! I love coleslaw. Unfortunately, most coleslaws are mayo based which kinda takes away from all the health benefits of cabbage, oh well. Cabbage is a great food, especially when trying to lose weight, because a cup of it raw is only 22 calories. That same cup has 85% of your vitamin K needs for the day and over 2g of fiber. 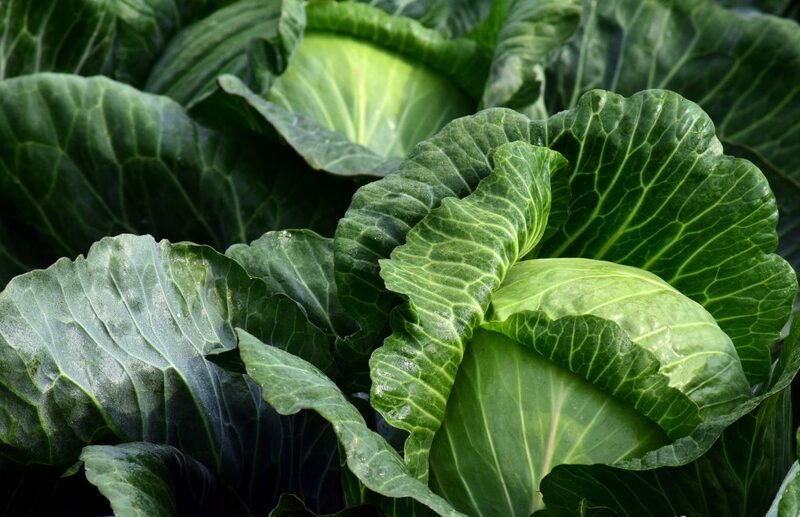 Also high in vitamin C and vitamin B6, cabbage is full of antioxidants. Cabbage is great when simmered with flavorful broth until nice and tender. Lentils are in the legume family, kinda like little beans. Lentils, like beans, are very high in protein and fiber. Half a cup of lentils will give you 9g of protein and about 8g of fiber. A lot of the fake burgers contain lentils (by fake I mean veggie burgers, sorry if that was offensive) because of their protein content. Lentils are also a great source of a long list of vitamins and minerals. Lentils, unlike beans, do not have to be soaked before preparing. Lentils can be cooked like rice or quinoa. They can also be added to soups or salads to bump the nutrition up a notch. Another super food, surprised? I doubt it. Everybody knows spinach is good for you. But it’s especially good for those who are trying to lose weight. 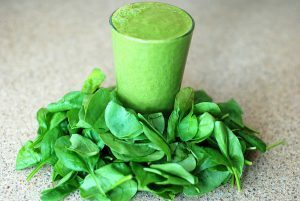 A cup of raw spinach is 7 calories…7 calories!! That’s nothing! Spinach is full of vitamin K, A, folate, magnesium, iron, potassium. Spinach makes a great base for a super salad, can be sautéed with oil and garlic for a healthy side dish, or can be added to any smoothie for a nutritional boost. Last on my list, but certainly not least, are almonds. Almonds have become popular because of their heart-healthy nutritional stats: 1 ounce of nuts has 163 calories, 6g of protein, and 3.5g of fiber. Almonds are pretty high in fat, but it’s the “good” kind of fat, the monounsaturated fats. Swapping out your regular snack with a handful of almonds is a great way to incorporate more fiber and protein in your diet, which will keep you feeling fuller, longer. Besides being high in protein and fiber, they are also chock full of all kinds of nutrients and vitamins that are good for us. Now that’s a healthy list. A bunch of healthy vegetables, beans, nuts, and healthy proteins. That’s what it all comes down to. If you are trying to lose weight, eating healthy is paramount. You are going to have to find a way to eat less calories and exercise more. Unfortunately, when we start cutting calories, we tend to get a lot hungrier, which makes it even more difficult to eat less calories. Finding foods that are high in fiber and protein (like the 12 examples above) will make it easier to stay full on less calories. For example, a cup of sweet potatoes is only 100 calories. 100 calories of sweet potatoes is going to feel a lot more filling than 100 calories of white bread. Not to mention all the good vitamins and nutrients you are also consuming with the sweet potato. I recommend making healthy changes gradually. Start introducing yourself to a couple of these foods a week, and with time your diet will significantly improve. If you change your diet too drastically and too quickly, odds are you aren’t going to last. 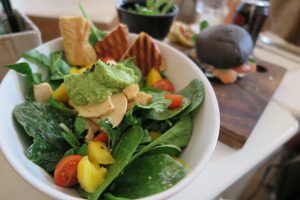 I hope this article was helpful and I hope it helps you start eating healthier. Remember, when eating the right foods, you can eat more and still lose weight. If you have any questions or comments, hit me up. Happy Thanksgiving everyone!